Archaeology at El Per**ú-Waka’ is the first book to summarize long-term research at this major Maya site. 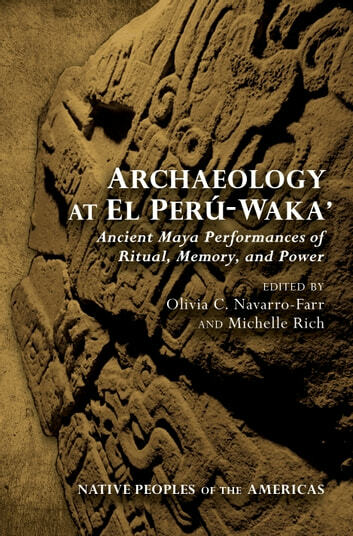 The results of fieldwork and subsequent analyses conducted by members of the El Perú-Waka’ Regional Archaeological Project are coupled with theoretical approaches treating the topics of ritual, memory, and power as deciphered through material remains discovered at Waka’. The book is site-centered, yet the fifteen wide-ranging contributions offer readers greater insight to the richness and complexity of Classic-period Maya culture, as well as to the ways in which archaeologists believe ancient peoples negotiated their ritual lives and comprehended their own pasts. El Perú-Waka’ is an ancient Maya city located in present-day northwestern Petén, Guatemala. Rediscovered by petroleum exploration workers in the mid-1960s, it is the largest known archaeological site in the Laguna del Tigre National Park in Guatemala’s Maya Biosphere Reserve. The El Perú-Waka’ Regional Archaeological Project initiated scientific investigations in 2003, and through excavation and survey, researchers established that Waka’ was a key political and economic center well integrated into Classic-period lowland Maya civilization, and reconstructed many aspects of Maya life and ritual activity in this ancient community. The research detailed in this volume provides a wealth of new, substantive, and scientifically excavated data, which contributors approach with fresh theoretical insights. In the process, they lay out sound strategies for understanding the ritual manipulation of monuments, landscapes, buildings, objects, and memories, as well as related topics encompassing the performance and negotiation of power throughout the city’s extensive sociopolitical history.